Whyteleafe took the points against one of their promotion contenders in the Bostik South East with an impressive performance at Church Road that saw them maintain fifth place. The game started with both teams looking focused and lively with Phoenix having a few early chances but Leafe also came close with Kelvin Ogboe having a good shot early on and indeed it was the home side that gradually upped the pace and dominated the proceedings from midway through the first half onwards. The dominance paid off in the 34th minute and it was Lauris Chin that got his name on the score sheet and put the Leafe one up with a close range shot that Phoenix keeper Steve Phillips was not able to save. Whyteleafe were now in control of the game and another goal looked inevitable. With some fine performances throughout the side it was man of the match Valentino Carpene who got the second goal in the 52nd minute and there was no turning back for the Leafe who look to be real play-off contenders this season. 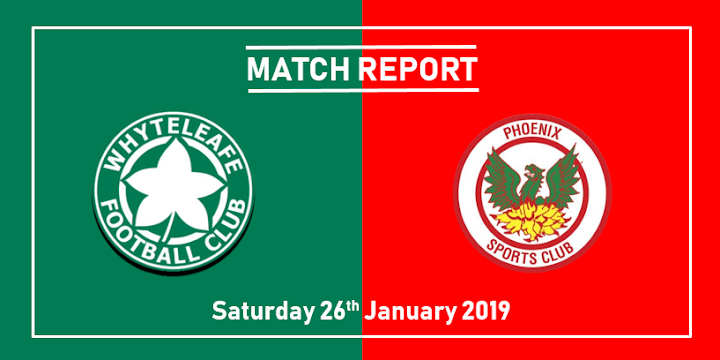 With the game drawing to a close Phoenix defender Zak Byron was dismissed from the field of play in the 90th minute, quickly followed by Danny Young and Whyteleafe's Laurent Mendy in the final seconds of the game.